Little Man Produced By John Fields - New Music! I am super happy to announce that Little Man will be releasing new music this year! On top of that it's even more exciting to have John Fields a well known top producer collaborate with me and take the reigns as producer, engineer and mixer. John has worked with Soul Asylum, Jonas Brothers, Jimmy Eat World, Miley Cyrus, Pink and so many more artists you've heard of. You can expect a good mix of rock, acoustic and psychedelic rock with these new songs keeping the classic Little Man vibe yet nudging a little more modern here and there and interpreted through John's lens. John is taking these songs to new heights further than I could have expected. Things are sounding amazing so I can't wait for you to here them! Finding someone to record your songs can be a difficult thing. As an artist I find it difficult to trust my songs in another person's hands. The albums Little Man has put out in the past sound fantastic and I wanted to keep moving in that direction and give these songs the treatment they deserve. I've got an album's worth of songs demo'd out and it was a matter of finding the right person to interpret these songs in a bigger way. I wanted more than just the band rocking, these songs need more realized elements and those production tweaks and additions are important especially for some of the more laid back songs. While trying to spread the word that I was looking for someone to record our upcoming album, a few people recommended John Fields. I wasn't too familiar with him but I had heard his name before as a top producer here in Minneapolis. We met up and had a great meeting talking about classic rock and bringing in more modern aspects to my music. Fields brings in an element that is all his own in a creative way that bumps these songs up so many more notches. It's so fun being in the studio with Fields working out the new material. He has great recording techniques and is very creative in the process which makes it a joy to be involved with all that. Below is the first track we recorded. 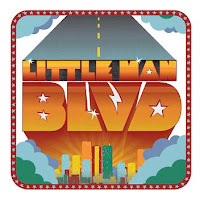 There's so much more to come plus the BLVD video so sign up on the Little Man Mailing List and we'll keep you posted! Are you ready?! Here's the first single! Send us a reply, how would you describe the new song?